Time is passing quickly–I’m gearing up for the Houston International Quilt Festival that is coming right up at the beginning of November. In addition to books, I’ll be there with Judith Skinner and Houston’s own polymer clay artisan mask-maker Rebecca Stout. 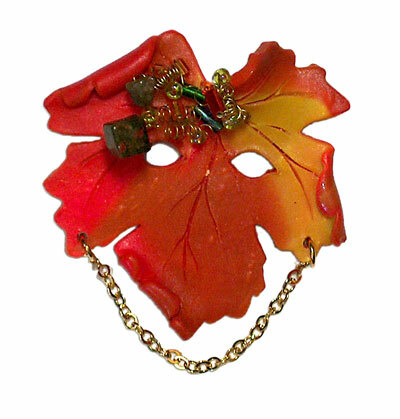 She’s got quite a few masks featured in the upcoming book A Collection Of Polymer Clay Masks, and here’s one of them! Now that we are past the Autumnal Equinox, we’re starting to feel a nip in the air at the night and the leaves are beginning to show a little color–though not yet as much as you see here! 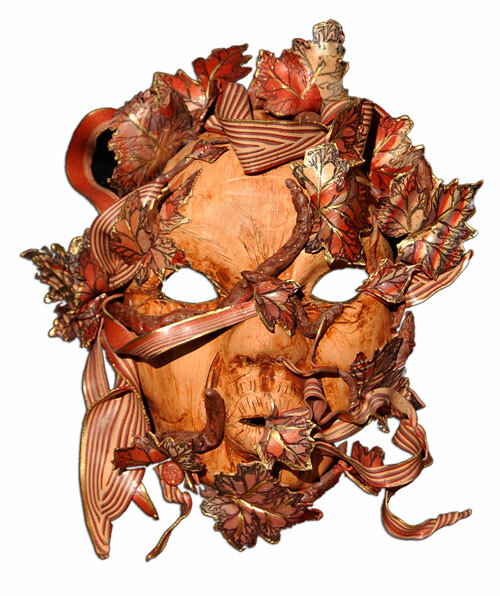 Rebecca’s mask at right is big enough to wear to any Fall Festivals, and the one shown below by Judy Jaussaud can be worn as jewelry–it’s less than three inches large! Sarahjane, These masks are beautiful. I am quite the fall fanatic myself and I’ve always appreciated art that excentuates the autumn season. I love the colors and the smell of spiced pumpkin and cinnamon apples that tends to follow in the air. Good luck at the festival in Houston!! Thank you Emily! I’m ready for a batch of toasted pumpkin seeds too–a favorite fall season treat!